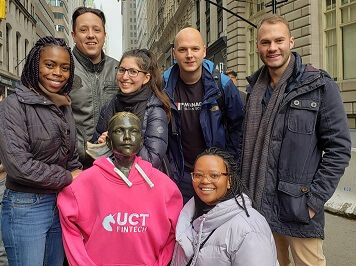 A study tour to the US confirmed two things for six Fintech master’s candidates: a burgeoning of disruptive fintech technologies, driven by artificial intelligence, blockchain and big data – and that UCT’s course and students can hold their own globally. “Unforgettable”, “Once in a lifetime experience”, “A series of adventures and inspiration”, the students wrote of their PSG Group-sponsored, three-day visit to New York and Boston, led by masterʼs course convenor and University of Cape Town (UCT) Associate Professor Co-Pierre Georg. The 2018 class is the first cohort of the interdisciplinary MPhil in Financial Technology degree, the first of its kind in Africa, offered by the African Institute of Financial Markets and Risk Management (AIFMRM), a postgraduate institute in the Faculty of Commerce, with courses by the Department of Statistical Sciences. The capstone tour provided invaluable contact with leading academics and creatives in these highly innovative spaces, and offered insights that the students said will shape their dissertations and future careers. 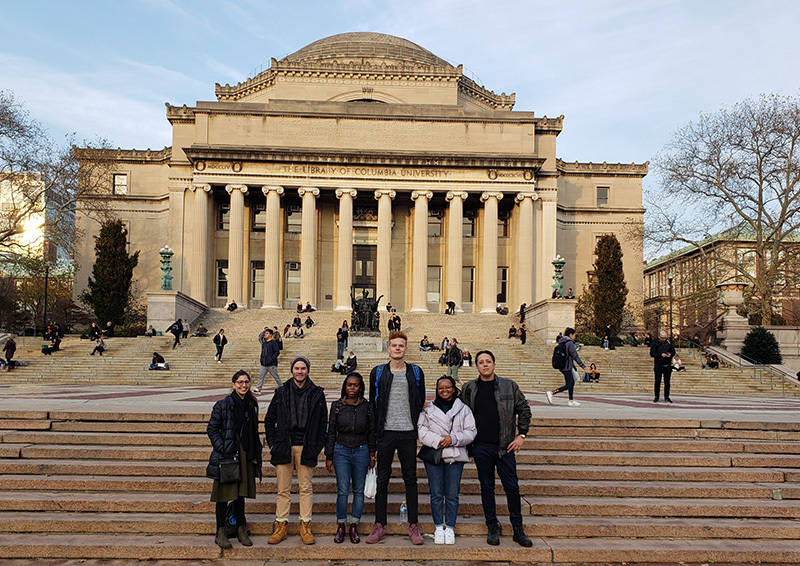 The MPhil Financial Technology students on campus at Columbia University. Their journey began at Barclay’s Rise New York, an accelerator hub for some of the world’s top fintech innovators and start-ups. Rise operates similar fintech hubs around the world, including in Cape Town, and some of the UCT MPhil programme was done jointly with Rise Cape Town. “It was surreal to see these iconic institutions,” said student Masego Modibane. On their first day in Boston the group attended an MIT fintech class, confirming for Modibane that UCT offers a world-class degree. A highlight was the visit to the MIT Media Lab where they joined research group meetings and enjoyed a tour of the facilities. Described as “an anti-disciplinary research laboratory”, the lab grew out of MIT’s Architecture Machine Group in the School of Architecture. Its research is not discipline-specific, but draws from technology, media, science, art and design. “The technology we saw in the lab is truly revolutionary and has inspired me to pursue studies at MIT and bring that technology back to South Africa,” Modibane reported. Student JonJon Clark said that coming from a computer science background, “just the idea of MIT got me giddy”. “There was something eclectic about the MIT Media Lab. It almost smelt different. If creativity was something that you could paint on walls, then this place had a coat in every room. Each visit offered a “keyhole” view into the Ivy League institutions, Clark said. Student Ryan Jackson said two things struck him. At an MIT FinTech Venture course class where students work through the intricacies of creating fintech start-ups, he noted just how competitive the fintech space is. It was an international class, from lawyers to engineers, each intent on finding new ways to disrupt the financial services industry. But he also realised the UCT group could hold their own in this space. For Ashleigh Favish, the scale of New York was reflected in the innovation they saw at Rise New York, creative input that continued at NYU Stern’s Creative Destruction Lab where they got feedback on their start-up ideas and dissertations. At MIT they met with Ripple Labs’ Evan Schwartz, an engineer who co-invented the Interledger Protocol, used for payments across payment networks. Schwartz shared his vision of how money will be transferred in the future (“in a similar way to data on the internet”), and the pros and cons of “streaming of money”. At Columbia Business School Favish met a South African-born professor who is exploring using machine learning and text analysis to predict the returns on asset managers, based on their prospectus releases. “This whole trip has been incredible,” she said. Student and class representative Kungela Mzuku was also struck by the meeting with Ripple Labs’ Schwartz. “What inspired me most about his story is how he navigated his career in a field that didn’t exist. In many aspects, I could relate. He covered the history of Ripple and how important it was for them to get their first client, and how this was the hardest part. For Aidan Fourie, the disruptive nature of fintech points to a bigger goal. In the transit between the halls of Harvard, MIT, NYU and Columbia, Fourie was also struck by the “immense world of opportunity” for hardworking, ambitious students. And he agreed that despite vast distances and disparate levels of technical and economic development, South African students are as capable and competent as those at Ivy League universities.